DALI Fazon F5 review | What Hi-Fi? Surely, for a serious audiophile, any decent conventional rival is going to stomp all over these resolutely style-led Dalis? Not so. While not flawless, the Fazon F5s deliver a hugely entertaining performance that, in some ways, is good enough to leave most traditional rivals struggling. The big news here is the use of aluminium cabinets. The enclosures are completed by a layered front baffle to create a rigid, nicely damped structure. The drive units are more conventional Dali fare; revised versions of those used in the company’s £2000 excellent Mentor 5 floorstanders. The upper 13cm wood-fibre-coned driver delivers everything from the 3kHz tweeter crossover point downwards, with the lower unit only lending a hand below 800Hz. Bass is tuned by a rear-firing port. These speakers certainly aren’t about analysis. They’re immensely musical, full-bodied and fluid, with excellent integration between the drivers. Some rivals dig deeper into a recording and quite a few are more tonally faithful, but the Dalis work well across the board. Play a high-res recording such as the Royal Scottish National Orchestra’s 24-bit/96kHz rendition of Shostakovich’s Symphony No.11, and they deliver bags of the insight and dynamic ability. Yet, feed them a low-bit rate internet radio signal and they’ll still produce likeable results. Sure the source material’s shortcomings will be readily apparent, but these Dalis are unwilling to let the transmission’s technical shortcomings spoil the music’s message. These are relatively small speakers, so it’s no surprise that their authority falls short of larger rivals such as ATC’s SCM40s. The Fazons don’t cope with very high volume levels with ease, either. But in most small to medium rooms they can generate enough volume levels to satisfy, and enough low-end heft to deliver bass-heavy music such as that from the Chemical Brothers with real conviction. Only a hint of softness at the lowest frequencies can be criticised. 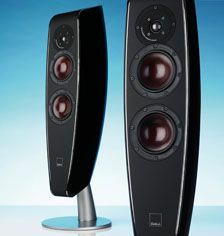 The impressive cabinets are a major factor in an articulate and unusually clean sounding midrange. Fans of great vocalists such as Frank Sinatra or Jill Scott are in for a treat. We’ve yet to find the perfect speaker at any price, so it comes as no surprise that there are some holes in the F5s’ performance. Yet, it’s rare that a speaker with so much attention to its aesthetics sounds so good. These are proper hi-fi.